London, New York, Chicago – 2 January 2018 – Vela, the premier market access technology provider, today announced the addition of Virtu Financial, one of the largest global electronic market making firms, to the growing list of electronic liquidity providers delivering market data through its new Systematic Internaliser (SI) Data Hub, part of its comprehensive MiFID II solution suite. Based upon Vela’s core feed handler technology, the SI Data Hub provides a low latency, high performance normalised market data solution. The functionality aggregates SI data and allows clients to receive their own bespoke SI price feeds through a single connection and unified API. The SI Data Hub also provides clients with their own configurable Best Bid and Offer feed for a holistic view of an instrument’s liquidity across venues. 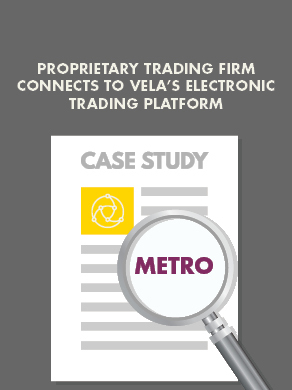 Vela delivers a similar solution for exchanges and multilateral trading facilities (MTFs) with the European Best Bid and Offer (EBBO) feed. Vela is currently integrating data from a number of firms that have already registered as SIs and some that expect to register shortly after the regulations become effective in January 2018. Vela’s SI Data Hub provides clients with access to multiple SI liquidity price feeds through a single normalised API, helping to address MiFID II concerns regarding best execution and liquidity fragmentation that will take effect on 3 January 2018. The Vela SI Data Hub supports the SI Consolidated Book providing clients with a single, consolidated Best Bid Offer (BBO) view of multiple liquidity sources to support price discovery and aid best execution. The SI Data Hub is also available as a software-only solution to run in-house for new deployments or as an addition to existing solutions. The SI Data Hub offering is complemented by Vela’s SI Execution Platform which provides clients with a single, low latency order routing platform to multiple Systematic Internalisers. Vela’s SI Data Hub is part of a wider range of SI and MiFID II solutions including Electronic Best Bid Offer (EBBO), support for Periodic Auction venues, enhanced Kill Switch functionality, and ongoing maintenance of exchange-driven changes. For more details on Vela’s full suite of MiFID II support and functionality or on becoming a member of Vela’s SI Data Hub, please contact us at sales@velatradingtech.com. Virtu Financial are a leading financial firm that leverages cutting edge technology to deliver liquidity to the global markets and innovative, transparent trading solutions to our clients. As a market maker, Virtu provides deep liquidity that helps to create more efficient markets around the world. Our market structure expertise, broad diversification, and execution technology enables us to provide competitive bids and offers in over 19,000 securities, at over 235 venues, in 36 countries worldwide. Virtu's corporate headquarters is located in New York with trade floors and development groups in North America, Europe and Asia. For more information about Virtu, please visit www.virtu.com or email us at info@virtu.com.